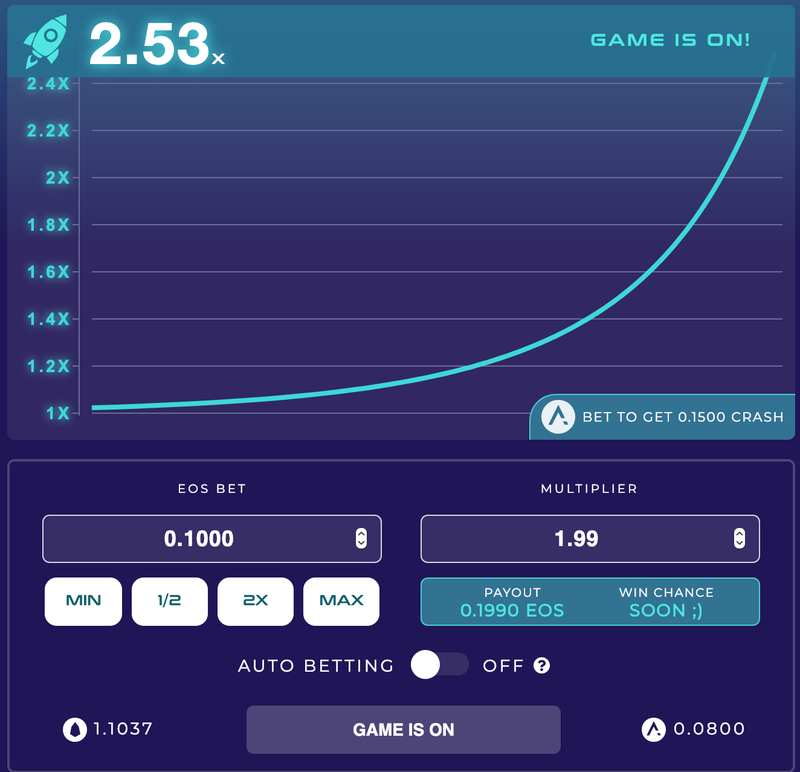 I know that the number of Dapp users have been increasing recently and EOS is the main platform that host the gambling dapp players. Actually it wouldn’t be wrong to say that EOS owes its transaction volume to the presence of high number of gambling dapps that become commonly known within the ecosystem. What is a Crash Game ? It is an online multiplayer blockchain guessing game that made as an increasing curve that may crash at any time. Each round of the game you have the opportunity to place a bet before the round starts. At any moment, you can click “Cash out” to lock in the current multiplier which awards you with your multiplied bet. The longer you stay in the game before cashing out, the higher the multiplier gets. Let’s go through the list of EOS dapps that I really enjoy playing. I will say that there are three platforms they come with well designed and exciting crash game in EOS , which are Crash by Trust Dice, EOS Crash Game and Crash by EOS Bet. 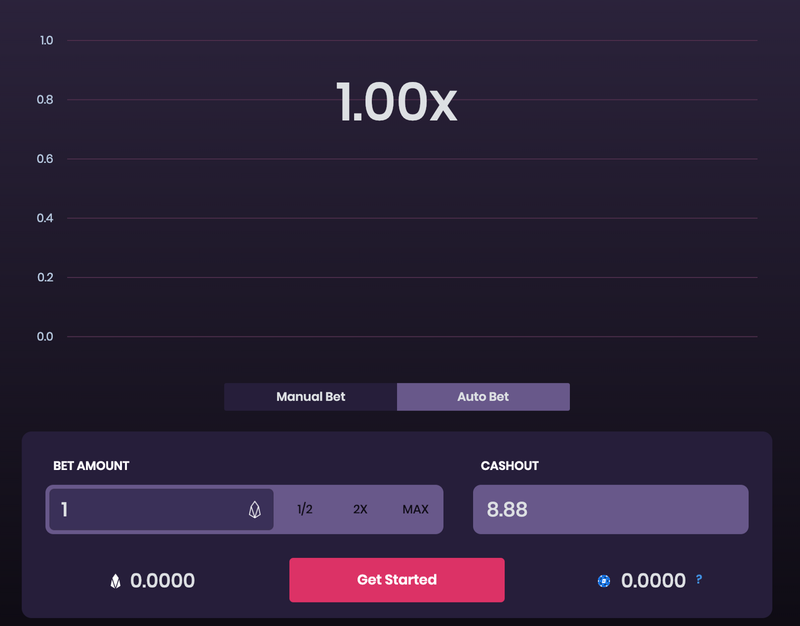 You can bet between 0.1- 1 EOS. No Charge of CPU, players don’t have to spend their EOS to stake it in the system; as I mentioned in the beginning. The team is planning to launch a mining system similar to their dice game, that will make the game more attractive to players for sure. Hope the team comes with this soon. EOS crash is the first multiplier game and it is also one of the games that I enjoy playing. I was mostly in EOS Crash but after release of new games, I would also prefer to experience other games that are also doing well in their platform. Here are some features of EOS Crash. Similar to the feature in Trust Dice, you can see the choice of other players in EOS Crash too. I will say the only thing that I couldn’t like in EOS crash is its UI. I makes me feel a bit complicated and still hard for me to used to it although it is the first crash game that I started to play very early. You can play the game both manually and automatically. It has a relatively simple UI compared to EOS Crash. To summarize my article, I want to say that again I really like the crash games more than other dice games. It feels more exciting and fun for me. It worths to experience the seconds that you wait for the moment curve crashes. These are the dapps that I could play so far, but I will keep updating the information in this article. Please let me know if there is any other games that you suggest and think perform well on EOS ecosystem. I will try to track all the developments about dapps in this channel.